Samsung is said to be working on a new version of its Galaxy S9 series smartphones dubbed as the Galaxy S9 Active. The company had previously launched the Active version of its earlier flagships as well. Much like its previous generations, the Galaxy S9 Active will also be a more durable and rugged variant of the Galaxy S9 series. The company’s latest flagship, the Samsung Galaxy S9 and Galaxy S9+ were announced ahead of MWC this year. After the launch, the Galaxy S9 Mini was spotted online and now a new report from Ready Tricks suggests that the South Korean giant is also looking to unveil the Galaxy S9 Active in the coming weeks. As per the report, the new smartphone with model number SM-G893 could be launched in the second half of 2018. As per a screenshot shared by Ready Tricks, the phone will be powered by the same octa-core Qualcomm Snapdragon 845 SoC, coupled with 4GB of RAM and 64GB inbuilt storage. The infinity display will also reportedly have the same screen size of 5.8-inch and QHD+ resolution (1440×2960 pixels). As for the camera, the phone will get a 12MP rear camera with variable f/1.5 – f/2.4 dual aperture. 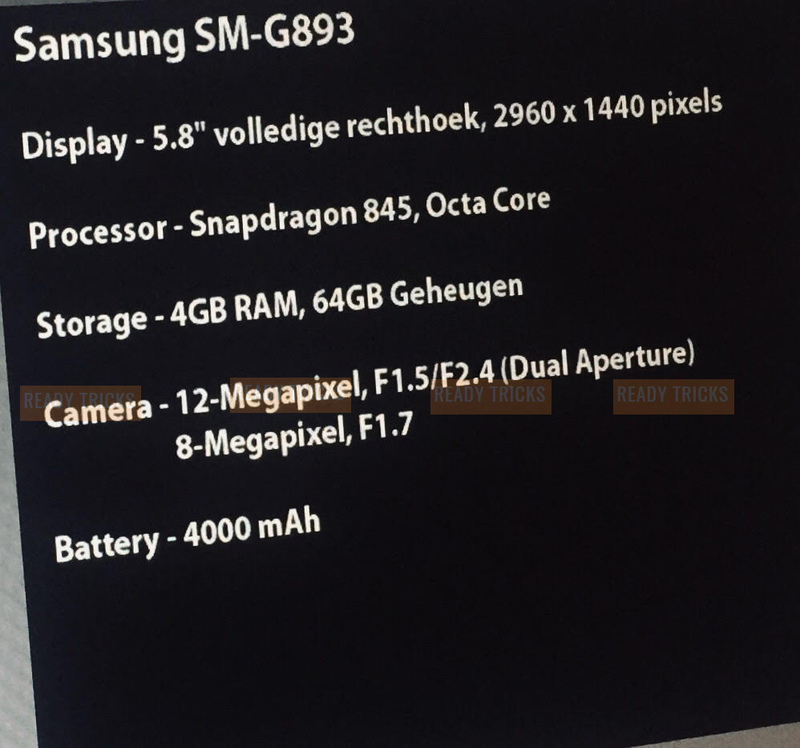 The front camera will feature an 8MP sensor with f/1.7 aperture. Lastly, the phone is said to be powered by a 4,000mAh battery under the hood. If we talk about pricing, we can expect the Galaxy S9 Active to bear the same price tag as the Galaxy S9 if not higher. However, considering the more durability aspect, it could be higher as well. As for availability, the Galaxy S9 Active might be launched in Q3 2018.